Click on photo at left to view full size. 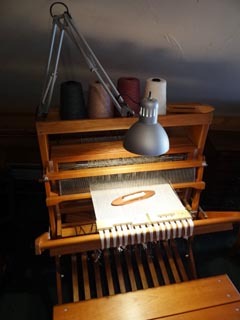 One of our customers, Diana, just ordered a Schacht Cricket loom, Variable dent reed and Cricket Bag so she could take it with her and weave anywhere, especially her local coffee shop. One of the perks of being in the Spinning and Weaving business is the wonderful people I get to talk to everyday. I always enjoy hearing what they are doing. Diana is a very creative person so I couldn’t wait to see what she wove on her new portable loom. She just sent me a photo of her first project on the Cricket loom. It is so interesting, I had to ask if I could share it on our blog. Diana kindly shared how she made the larger pieces that she inserted into her weaving. Weaving by chewiedox: The inlay sections are felted pieces that I made. I used ArtFelt paper and lightly needle felted everything to it, moistened it and ran it through the clothes dryer, then peeled the paper backing off. I used intact locks, sari silk fibers, noils, and bits of yarn. I just grabbed a selection and did the felting while I was at Starbucks. Sidekick – Unbeatable Travel Wheel – New Travel Bags! 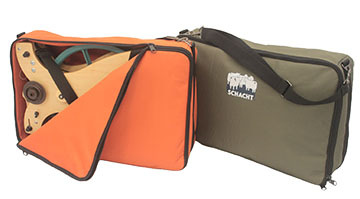 We have the new Schacht Sidekick Bags in stock now. In my opinion, the Schacht Sidekick Wheel can’t be beat! It folds easily, travels well and spins beautifully. You can even put the optional Schacht Bulky Flyer on it! What more could one ask for in a travel wheel? Sidekick wheels are in stock and on sale at Bountiful! Learn more about the Sidekick folding travel wheel in the Know Your Sidekick Video below featuring Jane Patrick at Schacht Spindle. I am pleased to share our granddaughter Kaitlin’s Jazzy Scarf Pattern and Kit with you. I taught her to weave on a Schacht Cricket Rigid Heddle Loom when she was 8 years old. 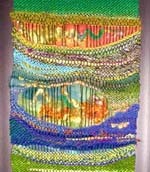 She designed and wove 2 scarves that summer, one was entered in the I Made it on my Schacht contest. When she was eleven, she designed and wove this fashionable Jazzy Scarf. I took her to the warehouse, set three big bins of Brown Sheep Naturespun yarns in front of her and turned my back. I did not want to influence her color choice in any way. I was surprised to see that she chose Red, Black and White. She knew exactly what she wanted to do with the colors. I insisted that we make a small sample to make sure. Her weaving plan worked out just right! She has great color and fashion sense. 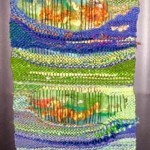 I love seeing what she comes up with when weaving! 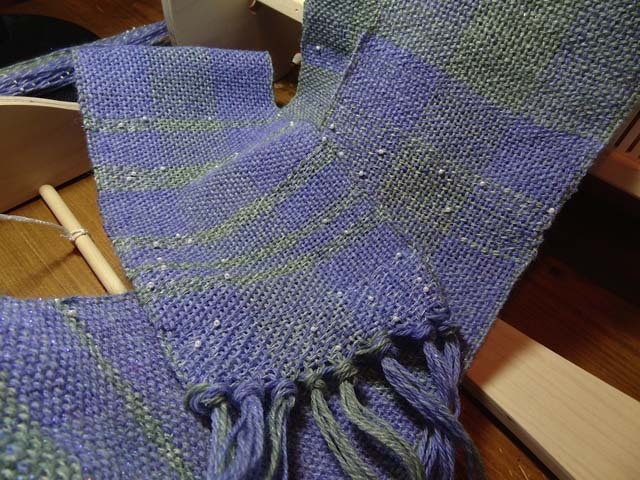 Sea Meets Sky Scarf Pattern for Rigid Heddle designed and woven by Jane Tigar, a brand new weaver! Jane fell in love with weaving while making a small perle cotton table runner during 4 – 2 hour backstrap weaving sessions. She decided to get a Rigid Heddle Loom. Jane called and we talked about what she wanted to weave and we compared the features of the Schacht Cricket Loom and the Schacht Flip Loom. Based on what and where she wanted to weave, she decided upon the Schacht 15 inch Cricket loom. We sent it right out to her along with some of our soft sparkly wool Alpine Meadow Yarns and some Nature Spun Worsted Yarns. Like most of us, she also has a stash of knitting yarns. She emailed me a photo of her first scarf a couple of days after she got her Cricket Loom. Then photos of her next 3 scarves quickly followed. I was impressed with her eye for color, her creativity and her enthusiasm for the craft of weaving. She named her scarf Sea meets Sky because of the soft blues and greens in the Alpine Meadow Yarns she wove it with. Jane’s pattern is available to print here Sea Meets Sky Scarf Pattern by Jane Tigar. She did some research on the name she gave her scarf and found something similar in the history of Pamlico County, North Carolina where she lives. Pamlico County was first settled by the Europeans in the early 1700’s. The Pampticoe, a Native American people who lived in what is now called Pamlico County called the area TaTaku which means where the land and the sea meet the sky. The Pamlico County slogan is: Where the land and the sea meet sky. 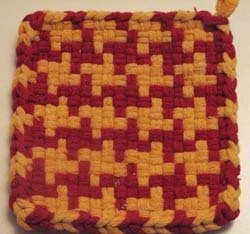 One of our overseas customers purchased a potholder loom and loops from us last year. 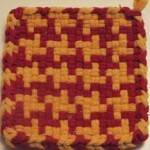 Their grandchildren 12 yr old Ofer and 6 yr old Abigail have been having a lot of fun designing and weaving potholders. They were kind enough to send us photos of what the children wove. The potholders have been being used and enjoyed by their family for over 8 months.The children were very creative with their designs and color choices! We are pleased to announce that Schacht will be producing a limited number of their beautiful Cherry Schacht Matchless Double Treadle Wheels. Bountiful will start receiving them in Mid-October and on thru the end of 2014. Contact us if you would like to reserve one of these beautiful wheels. Photo shows me happily spinning on my first Schacht Cherry Matchless Wheel. It is a delightful, beautiful, responsive wheel. I liked it so much that I got a second one. I now have one of my Cherry Matchless wheels upstairs and the other one downstairs. I also got the Cherry Bulky Flyer package for it and was thrilled with how easy the Matchless Wheel treadles with the bulky flyer on it and with how much yarn I can get on the large bulky flyer bobbin. 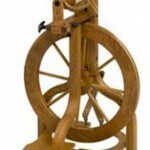 Spinners and Weavers appreciate the way Schacht thoughtfully designs their equipment. We recently re-launched our site bountifulspinweave.com and it is now much easier to navigate. 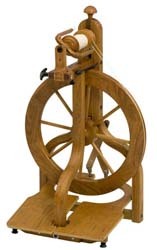 To celebrate we are having a big summer sale with great deals on weaving looms, spinning wheels, books, fibers, yarns, weaving tools and spinning tools. The NEW 30 inch Schacht Flip Looms are now IN STOCK and on SALE along with all their accessories. Loom is pictured above left with optional Trestle Stand and Flip Trap. 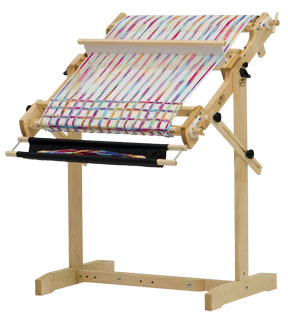 The much anticipated Schacht Flip 30 inch loom is the perfect loom for weaving wider projects such as shawls. I am a multi-harness weaver but I always have a project on my rigid heddle loom too. They travel well, warp up quickly and are easy to weave on. The Schacht Cricket Loom is featured in the 2013 December Holiday Guide of Martha Stewart Living! The Cricket Loom is a simple rigid heddle loom that is affordable and portable, and makes weaving easy. A great loom for new and experienced weavers of all ages. We have both the Cricket and Flip Looms in stock and on SALE. We also have reeds, new Variable Dent Reeds, Stands, pick up sticks, shuttles and many other items on SALE. Make this holiday season a weaving one by getting started with the Cricket or Flip Loom. How do you make time to weave? I am pleased to report that I recently found a way to make time to weave more. I have been weaving some scarves and small projects on my Flip Loom and Cricket Loom since I taught my Granddaughter to weave in 2009. I love the quick, easy warping process and the portability of Rigid Heddle Looms. I have a stand for both looms and I sometimes take them out on the deck to weave. The Weaver’s Idea Book by Jane Patrick gave me a whole new appreciation of the rigid heddle looms capability. Jane’s book is a treasure trove of patterns and ideas. Her Weaving on a Rigid Heddle Loom DVD is very informative and helpful too. However, I was not weaving on my beautiful Cherry Baby Wolf loom and I do love to weave on her. In our previous home, my Baby Wolf loom was in a corner of the dining room. It was so convenient to sit down and weave a few minutes while waiting for something to finish cooking. In our present home, my Baby Wolf Loom is in our bedroom. Now, the only time I have to weave is at night. It seemed too dark to weave even if I brought a floor lamp over to the loom. All this changed when we took our first trip to IKEA in Denver earlier this year. I stumbled upon a lamp that had the round post to fit into the lamp holder of my high castle tray! I purchased an LED bulb for it and now I can see what I am weaving even at night!!! It was such a little thing that kept me away from my loom. I did not think I could find time to weave, so I had just not taken the time to search for that type of lamp. Now, I look forward to shutting my computer down around 8 pm and weaving. 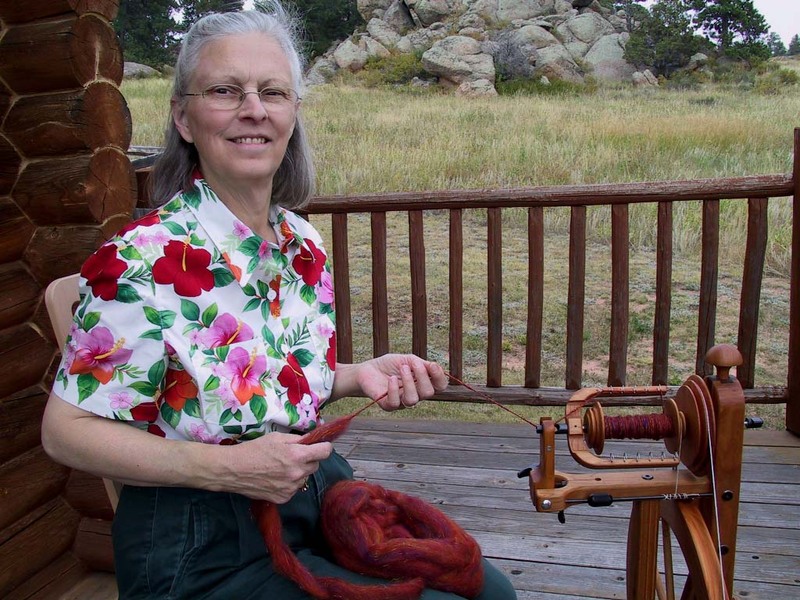 I remember hearing from my friends in the Estes Park Weaving Guild that you should have your next warp planned and wound before you take your project off the loom. That way you will always have something on your loom. I now have my next 2 projects wound and waiting and so very many more projects in my head. I am finding time to do some Spinning and I will be posting about the fibers I spin as well as about wheels and spinning tools and tips. I always say, if you just listen, you can learn something every day. And I do learn things every day from my customers. I want to give my customers a chance to share their Weaving, Spinning and Knitting Knowledge so I will be posting questions. I also really, really want to see what my customers are Weaving, Spinning and Knitting. I will be posting about Weaving and Spinning and updating you on new items, special offers and sales. A big bonus for me will be that having a blog will inspire me to find time to weave and spin! I hope you are able to make some time for Weaving and Spinning too.